My husband and I both have different versions of the first time we met. He remembers meeting me before I met him and although I remember the said event, I don't remember meeting him until months down the line. I guess I just left a lasting impression on him! 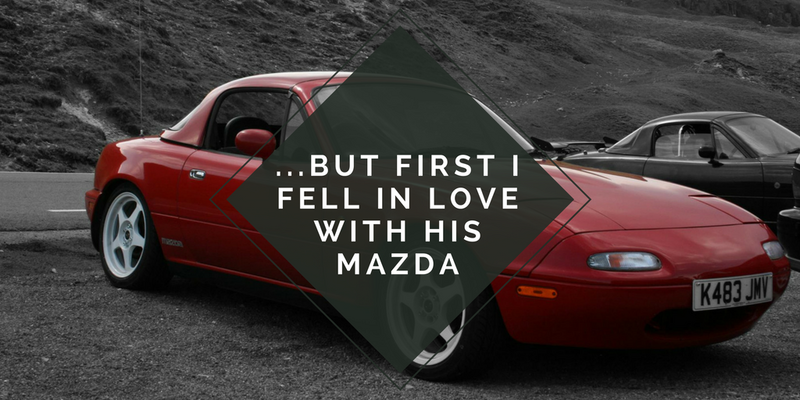 Today I thought I would share both versions of how we met in a post I'm calling "...but first I fell in love with his Mazda". When I was in university, lots of the people I spent time with studied Motorsport. I didn't...I studied Primary Education first before switching to Photojournalism, but I met some Motorsport students on the first night in the student union and ended up socialising with them a whole lot. As everyone was obsessed with cars, social events often involved something to do with driving, or watching car events. We would all get together and go for a Hoon, mostly around the Brecon Beacons. A Hoon is basically a car meet, where people then pick a route to go for a drive together. 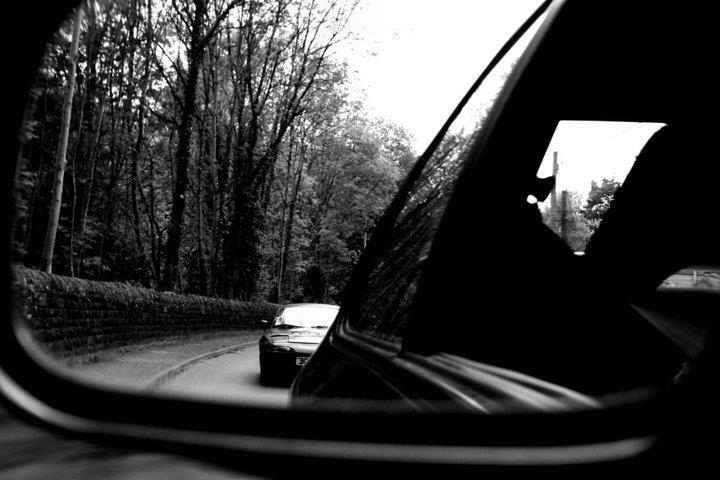 At the time I was also doing a photo project on portraits, and I was focusing on cars within this. For that reason I took my camera along to one of these Hoons. Now apparently the first thing I ever said to my now husband was "Can you pop your hood please". I then went ahead and took photos of his car. 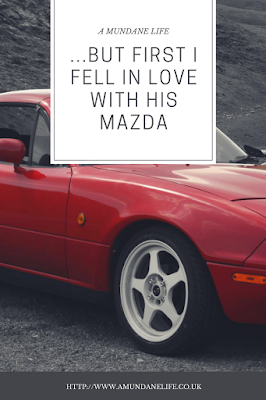 I have the photos of his car, a red (well faded red) Mazda MX5, and he is present in some group shots I took too, but I do not remember him personally. It sounds terrible I'm sure, but my excuse is that at the time I was in a relationship and was more focused on hanging out with him, and his housemates, then talking to people I barely knew. So this is where the title comes from. I noticed my now husband's car before I noticed him! The photo below was taken by myself at the Hoon he mentions so we were definitely both there! My version of the first time we met is very different to my husbands. My version takes place many many months later and this time it had nothing to do with cars...well not at the beginning anyway. A friend was having a birthday meal in Cardiff, and everyone actually lived in Swansea at the time. I grabbed a lift with a bunch of other people on the way to the restaurant, and when I arrived I ended up sitting with some of my husband's housemates who I had met previously. It just so happened that I ended up sitting next to my husband at the table in TGIs. Naturally we all chatted during the meal, and that's when the subject of cars came up. I found out he had an MX5, and well I always wanted to have a ride in an MX5 so I asked if I could grab a ride back to Swansea with him. I didn't want to go back in the other car as I didn't think the person was the best driver! We ended up driving back in the MX5 listening to Trivium. Well, we listened to Trivium to start off with and then ended up chatting and hit it off so much that we ended up taking a longer route back to Swansea so we could talk some more. It wasn't romantic at all though, in fact we will both admit that we didn't see each other like that at first. I was already in a relationship at the time, and had been dating this person for quite some time so was happy in that relationship. We ended up becoming best mates straight away after that night. We spent many nights chatting all night, and chatting so much that I'd fall asleep in his student house both of us just fully clothed and passing out on his bed. We'd go on random drives in the MX5 as it meant that we could just chat for hours and drive around aimlessly. We took part in scatter rallies together, and took midnight drives down to our favourite beaches. It wasn't until several months after we met that we both realised we had feelings for each other. My relationship came to an end, and just before I was set to move back to Kent...5 hours away from Swansea, I plucked up the courage to text him and tell him how I felt. It turned out that he felt the same and the rest is history. We've been together 9 years now and married for nearly 5. We have a lovely home together and a beautiful daughter. 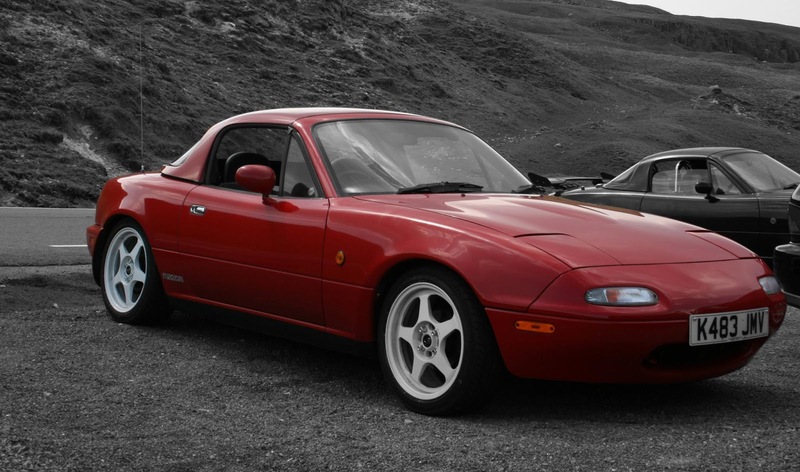 Unfortunately we don't have the MX5 anymore. My husband also has Epilepsy and he started having seizures shortly after we started dating. He lost his license for a while so sold the MX5 which we were both gutted about. I know that as soon as we are in the position to we will buy another one as for us it is kind of a symbol of our love and unity! 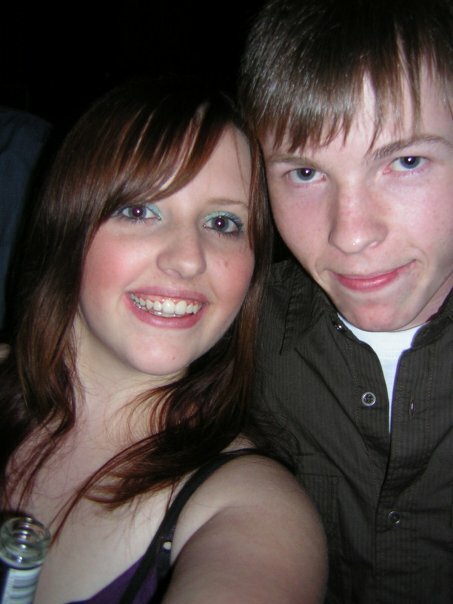 I'll leave you with the first photo I have of my husband and I. This was taken the day after my version of our first meeting. I also have many stories including my husband and I, including our first kiss dressed as Mr and Mrs Santa, and how I knew that he was the one after only a few weeks of dating. Ohhh! It's lovely to hear about another couple meeting because of a car. I met my husband 9 years ago because we both had Mk3 Astra's... We now have a Ford Galaxy and VW Polo. One of the Mk3's is in car heaven while the other's whereabouts is unknown.